Since August 2014, 150 elementary and middle school students have been attending the newly completed John C. Dunham STEM Partnership School at Aurora University. This innovative learning facility, which serves third through eighth grade students from four regional public school districts, is designed to address regional and national deficiencies in science, technology, engineering and math education. 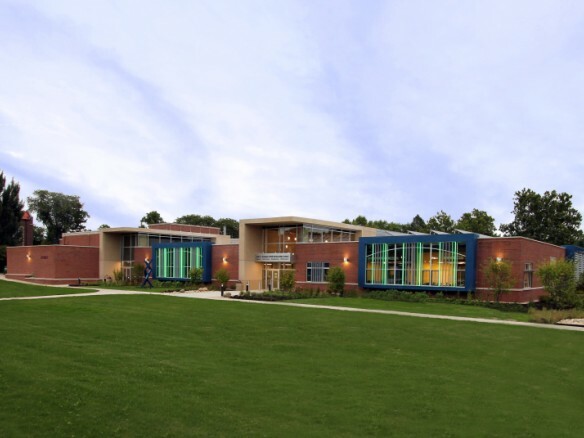 The School and its new educational model results from the collaboration between University officials, school district leaders, teachers, nonprofits, local businesses, legislators, and Cordogan Clark & Associates Architects. It is staffed through a unique professional development strategy that engages teachers from the partner districts as faculty while they complete AU graduate coursework and become leaders in mathematics and science education. “We know that the work which begins here will reach across the nation and show other communities the pathway to truly creating an outstanding STEM-based academy for the future of our county,” said Dr. Rebecca Sherrick, President of Aurora University. The building’s design includes eight grade-school classrooms, an open forum where classes can work together, and six labs that will be shared by University and STEM school students. The tables in the classrooms and most of the labs stand on locking wheels that allow teachers to easily rearrange their classrooms. Electricity is fed from the ceiling so that equipment can be plugged in virtually anywhere, eliminating the traditional “back” or “front” of a classroom. Classrooms feature generous natural light— which helped earn the building sustainability points — and much of the piping, plumbing, insulation, and shelving is exposed so students can learn how they work. A rooftop garden and a greenhouse, as well as the school’s boiler room and data center, are enclosed with glass so that students can peer in.